This week didn’t hold as much progress as last week on the challenge. We were out of town for Thanksgiving and had a few days where we ate meals elsewhere – at friends’ houses, etc. But I’m happy with the things we did use – and we didn’t add anything! One evening for dinner, we cooked up the Ohio City Pasta – I believe we had red pepper and some sort of basil/spinach mix. 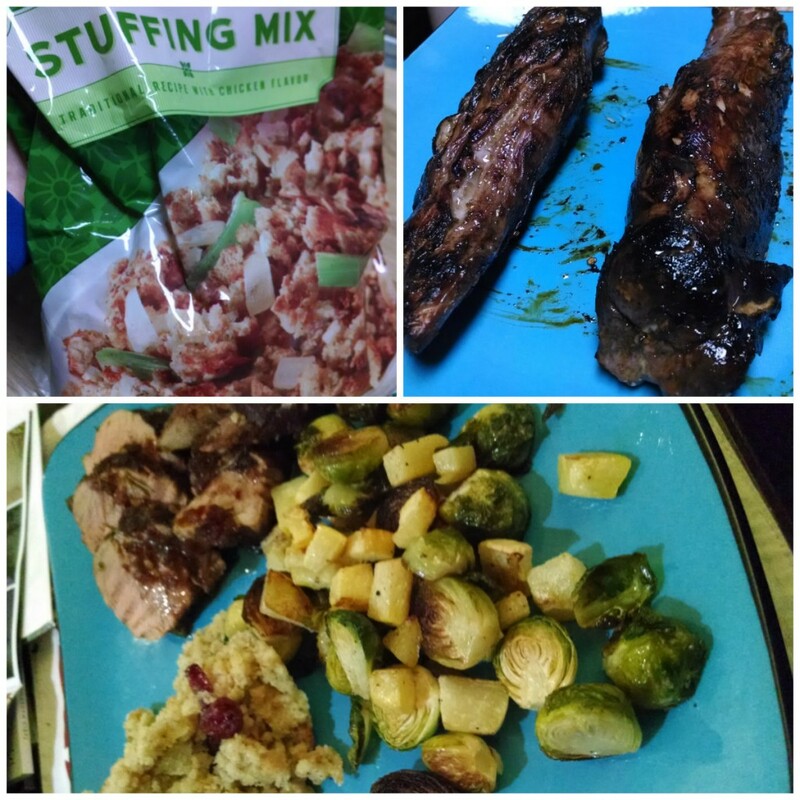 It tasted great mixed (especially with a glass of leftover wine from Friendsgiving!). We also needed another quick dinner one night, so we baked one of the frozen Pizza Joes pizzas. 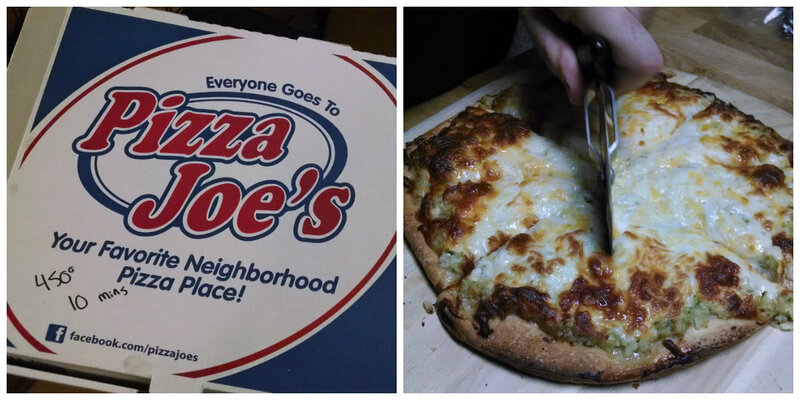 Pizza Joes is a local chain that’s centered around the area where I grew up, and I love them. My favorite pizza place ever. So when Mark travels to one particular site for work, he ends up near one of their locations and he will sometimes pick up half baked pizzas that we finish off in the oven. 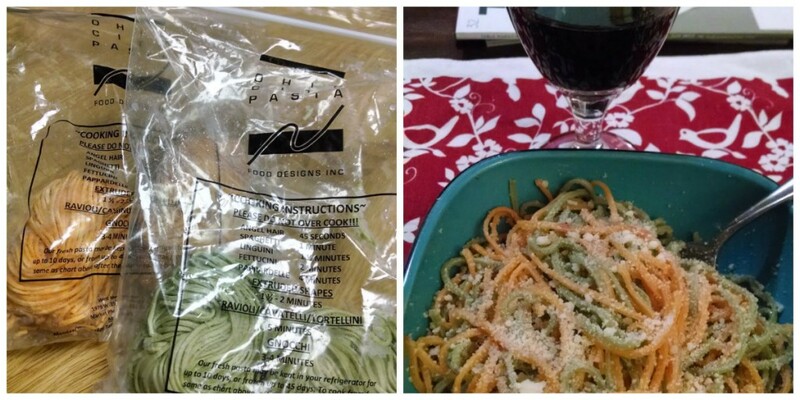 Much better than fully cooked pizza that’s frozen after the fact. We had the veggie ranch one. We also gave a jar of the Penn’s Corner hot pepper jelly to a friend who was visiting to try, so that took one of the jars in the pantry. Though I’m less worried about using those up now that I know of a great marinade recipe. So after week 4, here’s where we stand. Going to kick it up a notch this week. 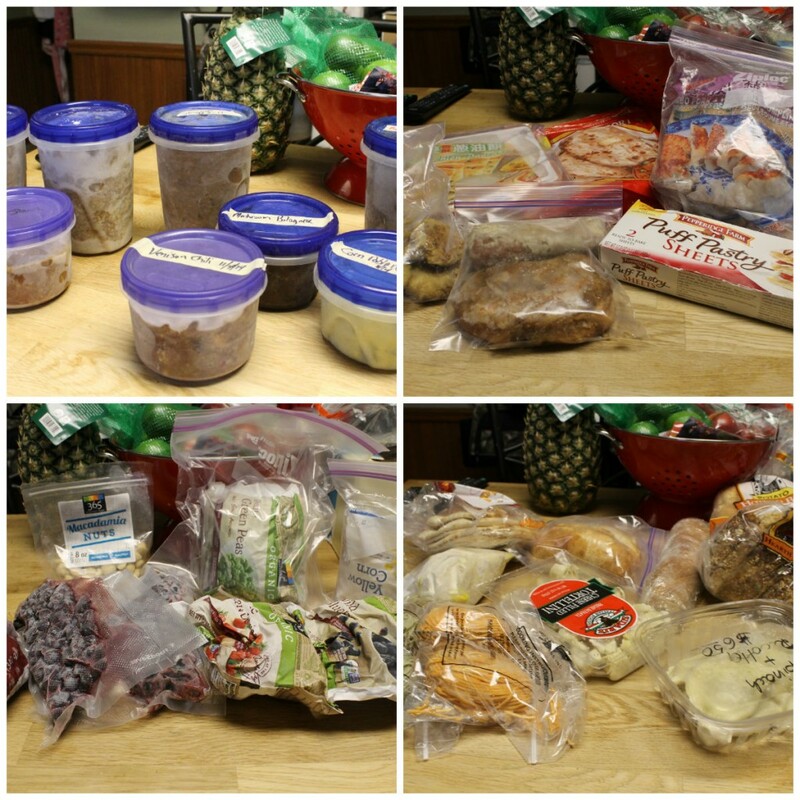 This week we chipped away at more items from the pantry and freezer, making more progress than I anticipated. 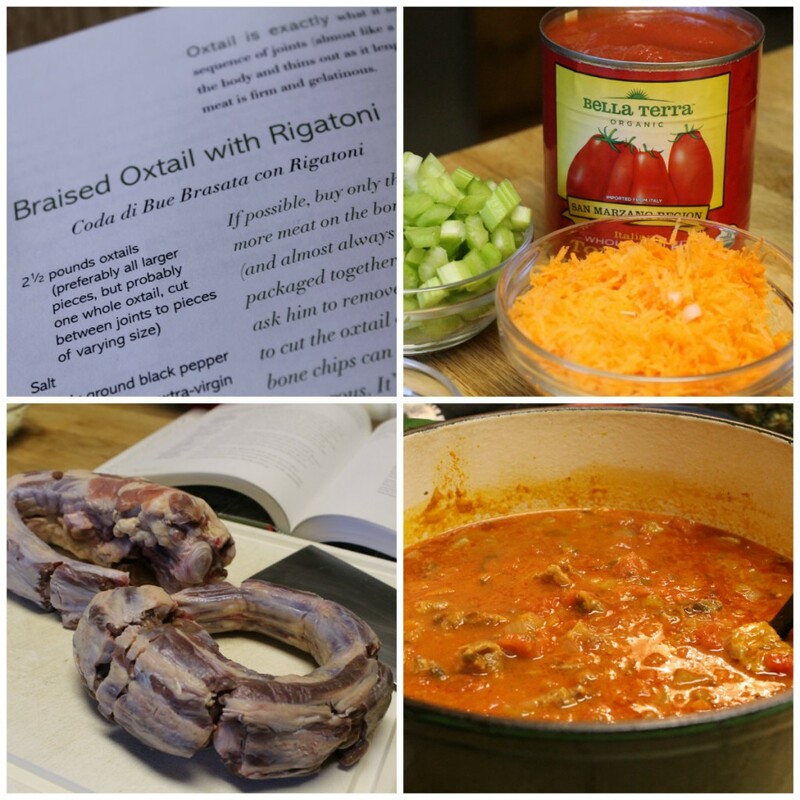 We were able in some cases to strategically use recipes for the things we wanted to eat that included some ingredients we already had. Which I guess is exactly the way you do this! 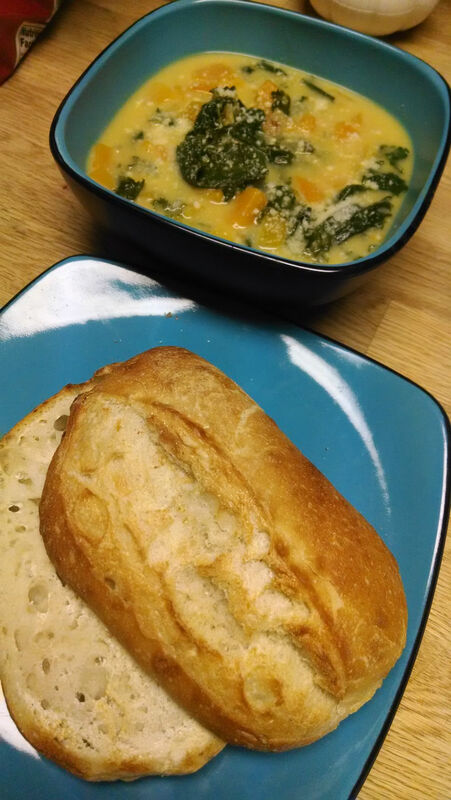 I made a delicious winter squash chowder with some butternut and acorn squash and kale from our CSA, and I toasted up the one remaining ciabatta roll for us to split as a side to dip. It actually went really well with the chowder! When I posted last week that I was having trouble finding ways to use hot pepper jelly, Penn’s Corner tweeted me this link to a recipe for Spicy Pepper Jelly Marinated Pork Tenderloin. So I made that, with some roasted turnips and brussels sprouts and some bagged stuffing from the pantry as a side. I highly recommend the marinade if you like spicy, flavorful marinades. 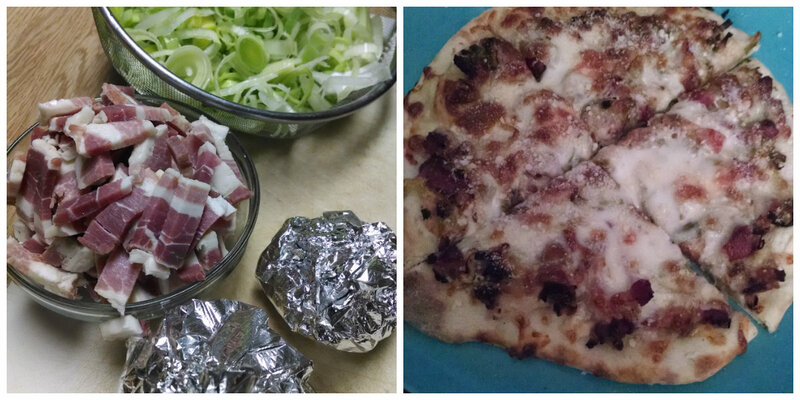 Friday night, I roasted two heads of garlic and took the leeks from the CSA and the bacon from the freezer and made toppings for Mark’s sourdough pizza crust. (He’s the pizza guy in the house.) Delicious, but let’s just say that using two heads of garlic as sauce, where we each virtually ate a whole head of garlic, was a bit….much. One night we had burgers and fries, so we used up half of the kaiser rolls and half of the bag of fries. Sunday night we had our annual Friendsgiving dinner with our best friends. Instead of a turkey, which we will all be eating this week, we decided to make prime rib. 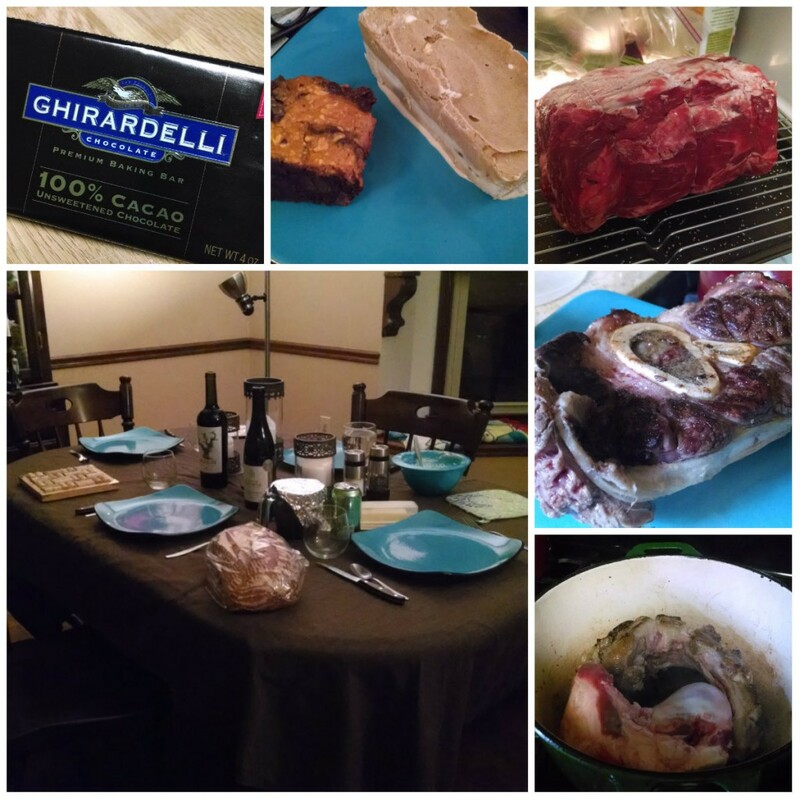 Mark did the prime rib, and chose a recipe that required roasting some other meat with it – so we used an oxtail, a beef shank and beef soup bones. I did the dessert, and sort of lost my mind. I decided to make pumpkin brownies, which used up half of the unsweetened chocolate bar. And that’s when I jumped off the deep end and decided to make 3 homemade ice creams from the Jeni’s cookbook: salty caramel, maple with buttered nuts, and sweet potato with toasted marshmallow. And then make them into terrines. But I forgot that a mini loaf pan might be “mini” when it comes to breads, but when it comes to ice cream, it’s a LOT. And so it looked kind of like a giant brick on the plate. But it was delicious – just ridiculous. We were so hungry I didn’t take much time to take good photos, but it was all great. So here’s where I stand now after three weeks. Made a lot of progress this week, for sure! This week was a bit crazy when it came to meal planning, since we had to do a lot of unexpected changes at the last minute. Mark’s aunt passed away, and we had some out of town days and some takeout days. But life is always throwing you something unexpected, so we rolled with it and still managed to get a few items checked off the pantry/freezer list. 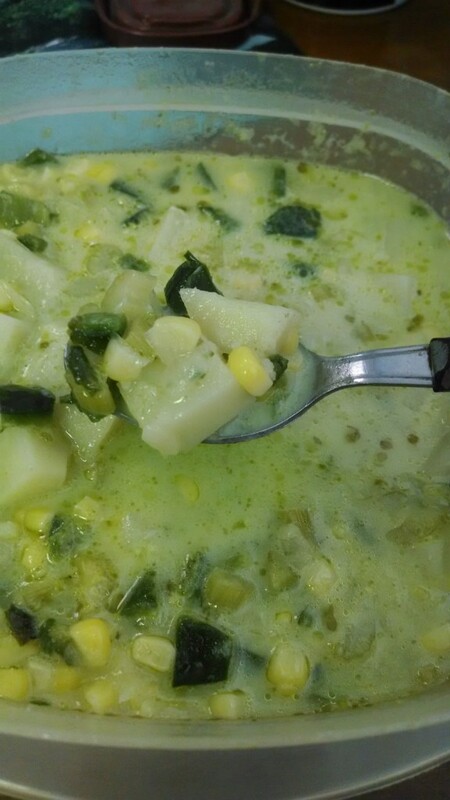 One day last week, I took the leftover corn and poblano chowder as my lunch one day. And I remembered why it is that we bothered to save it. It’s delicious. 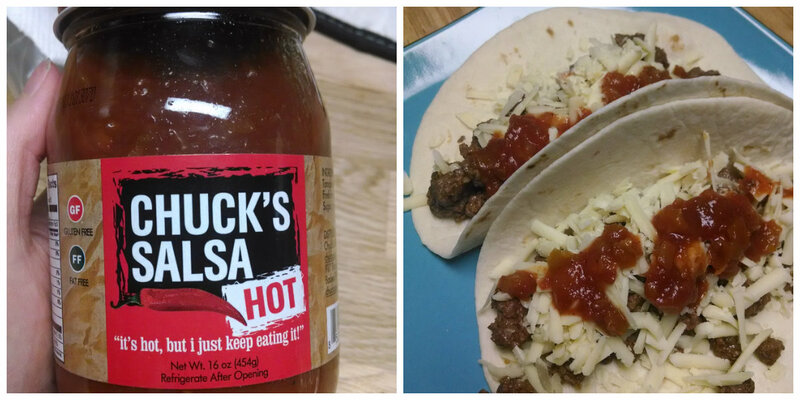 One night we had a quick taco dinner, and instead of opening a jar of our homemade canned salsa, we tried out the jar of hot salsa we had picked up at a Farm to Table event a very long time ago. Delicious, with a hint of peaches. Before we left for Cleveland, we were exhausted from running around all day and neither of us really wanted to cook. 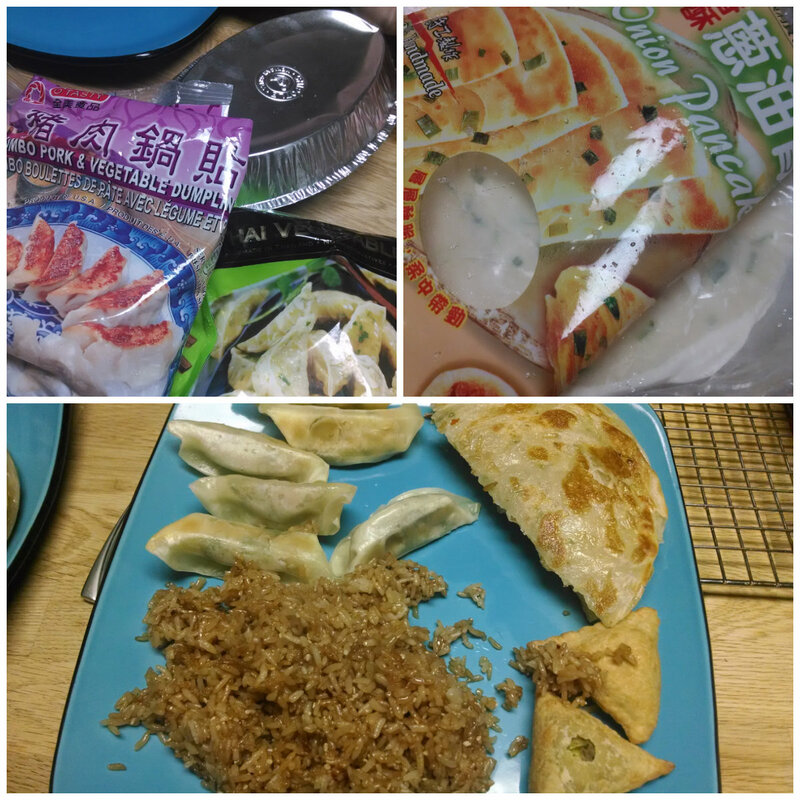 So we ate a ton of appetizers, including gyoza, green scallion pancakes and some samosas. Mark made fried rice from some leftover Chipotle rice and we made a dipping sauce from mirin, soy sauce and sesame oil. My phone photo doesn’t make it look too appetizing, but it was. Especially because it just took a few minutes to make. Which is exactly why we bought that stuff in the first place. I didn’t quite use up all the gyoza in the bags, but we’re getting close. Last but not least, Mark made his grandma’s cheesecake to take to Cleveland to share with family, since it was one of his aunt’s favorite. 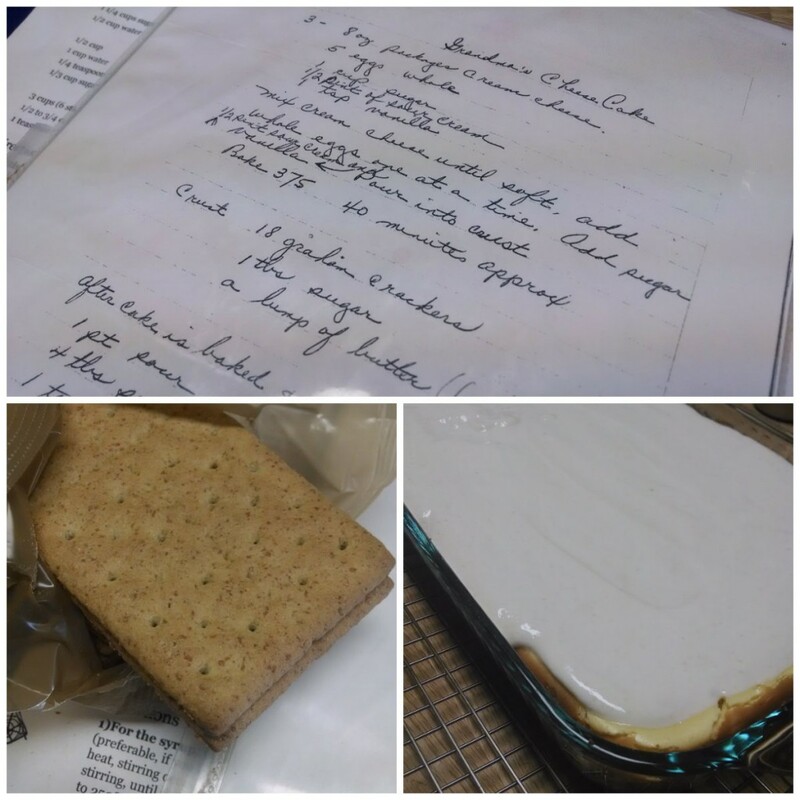 We used graham crackers from the pantry for the crust. So at the end of week 2, here’s where we stand. Here’s where I stand now with pantry and freezer items. I can’t wait to see more of these crossed off. 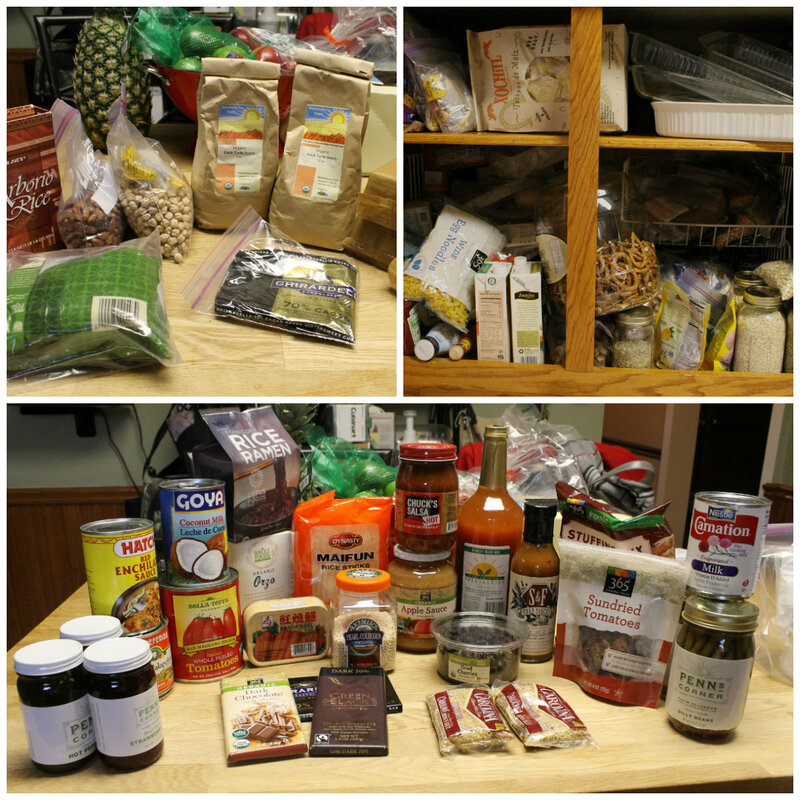 Yesterday I fessed up to the crazy amount of excess food we have stored in our pantry and freezers and created my own Pantry/Freezer Clean Out Challenge. I didn’t waste a lot of time, deciding to ride the wave of motivation and start using up some items this past weekend. 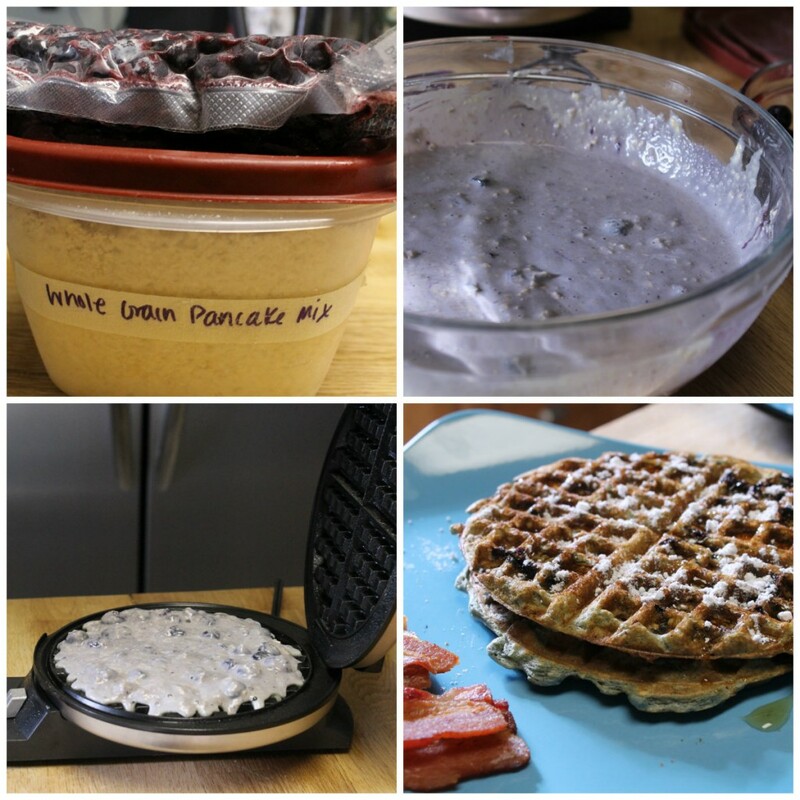 I opened a pack of frozen blueberries and we put half in the batter for the waffles and I put the other half in yogurt. For dinner on Sunday, I was going to be home long enough that I could make something that took a few hours to cook, so I took two of the three packages of ox tail that we had and the two cans of whole tomatoes in the pantry (leftover from when we didn’t have any more of our home preserved ones last season) and a bunch of CSA items and made Braised Oxtail over Rigatoni from Lidia’s Italian-American Kitchen. So that put a miniscule dent in the pantry and freezer stash. But that’s how I’m going to chip away at the excess! My second stop on the discount grocery store tour was Aldi. Owned by a German family company, Albrecht Discounts, Aldi is one of the no-frills discount grocers who eschews fancy displays and wide product selection for low prices. Perhaps most interestingly, Aldi is owned by the same company as Trader Joe’s, its higher-end counterpart. 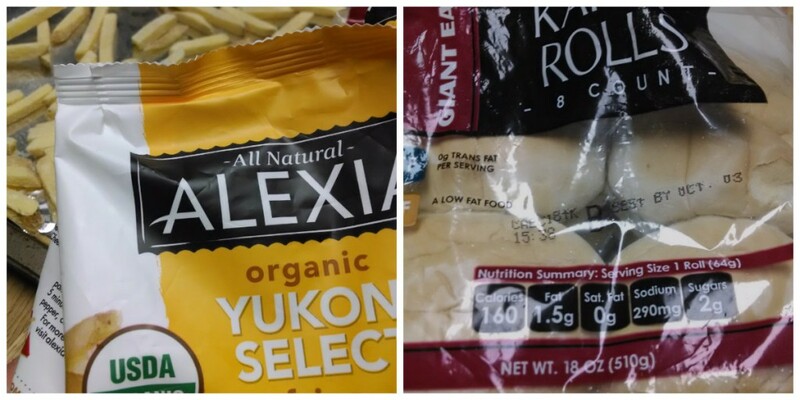 While Trader Joe’s carries more organic selections and higher quality meats, when it comes down to the come down, they have similar products on the shelf. 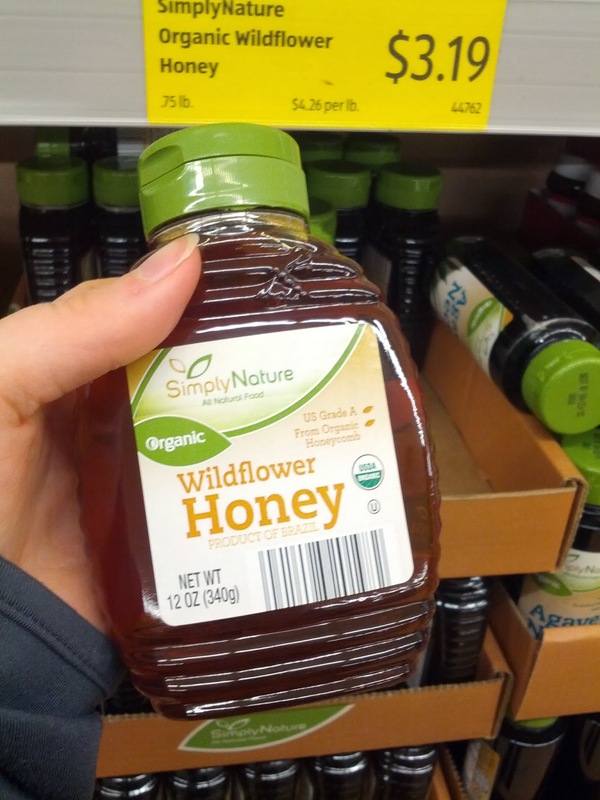 It’s heavy on the private label items, which means that the organic honey at Aldi might be the exact same thing as the organic honey at Trader Joes, only with less markup (because the cashiers at Aldi don’t ring bells or wear Hawaiian shirts?). I have issues with Trader Joes for other reasons, but if you’re going to buy private label stuff there, you’re going to pay extra for the fun stores and fancy graphic design. But on to the bargains. I was really happy to see that Aldi had a significantly higher percentage of organic products than Bottom Dollar (more than milk!). The first one I happened across was honey, at $3.19. It was also sourced from U.S. producers, which is good. Definitely cheaper than I’ve seen it elsewhere. I also saw a few items like organic salad dressings, but they are still processed foods and wouldn’t be the greatest choice. Stick to salad dressings that have to be refrigerated, since they are usually made with real ingredients, or go with lemon juice or olive oil/vinegar. Remember that just because something says organic doesn’t mean it’s a whole food or healthy. Just inside the door were bags of nuts at really reasonable prices. While they were all conventionally produced, nuts are among the products that are more protected from pesticides because of their shells. Organic nuts are another hard to find product, so these are a great alternative. And if you can bother to chop your own walnuts, you can really save on the price per pound by getting the bigger bag. 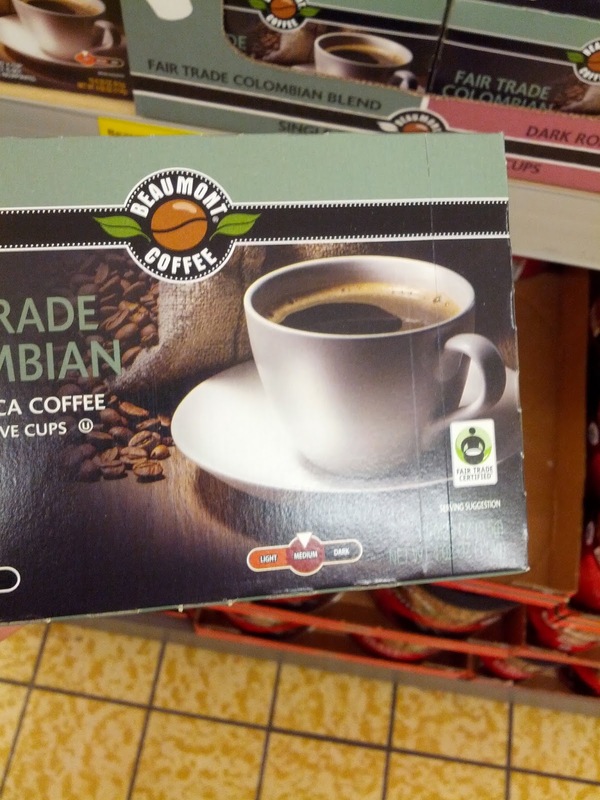 Many stores carry generic K-cup single serve coffee pods now. While I think it’s better from a waste perspective (and a quality coffee perspective) to use a refillable cup, these K-cups were relatively cheap, but still fair trade. Wouldn’t be a bad thing to have on hand for guests, etc. The produce section left a lot to be desired, since most of it was thrown all over the place. That could have been a product of the fact that we were there toward the end of a major shopping day and it might have been picked over by ravenous shoppers. It was mostly conventional, but the prices weren’t nearly as good as Bottom Dollar for the same items. 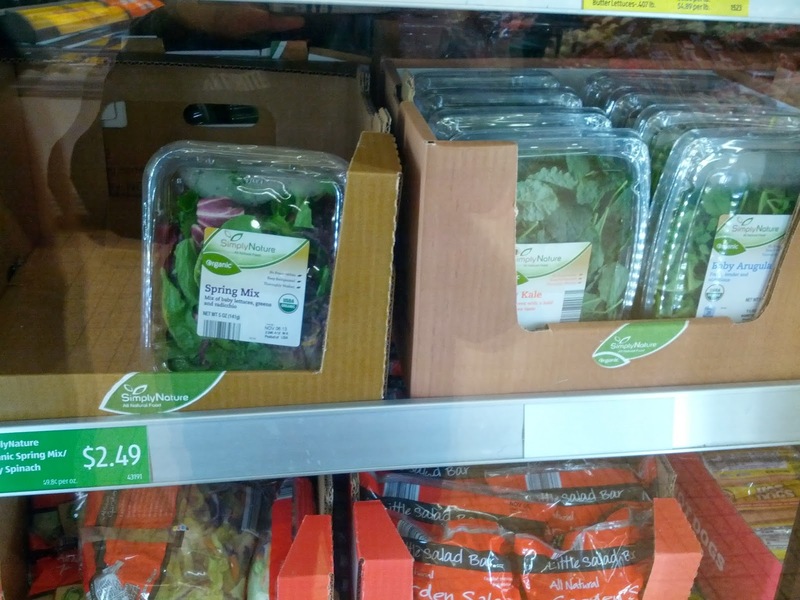 I did find organic salad greens in the refrigerator case, but they were small containers and for $2.49, not any better than the prices at Whole Foods! 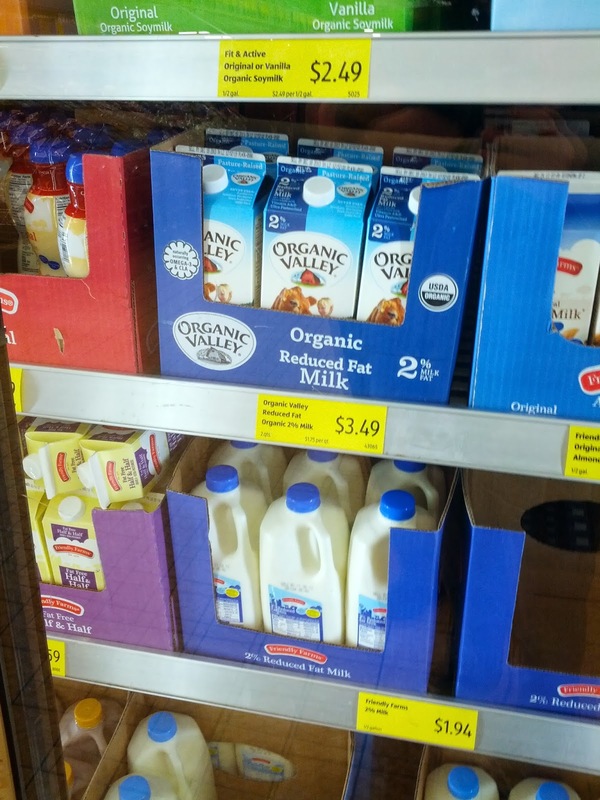 There were two decent options for milk, including Organic Valley 2%, which is a great buy at $3.48 for a half gallon. Organic Valley sources all of its milk from family farmers, and at Aldi it was a great choice. If that’s still too expensive, they also had an off-brand gallon of milk for $3.77 that at least was from cows that were not given rBGH, even if their diet wasn’t organic. Aldi had good prices on staples, just like Bottom Dollar. 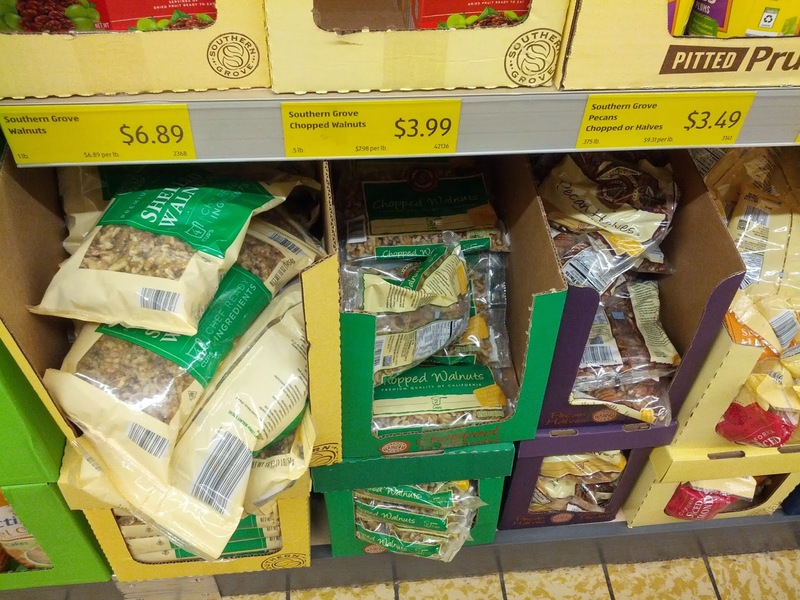 Rice and oats were the primary ones I found, but Aldi has a more limited selection than Bottom Dollar in general. The non-milk dairy and meat were not any different from Bottom Dollar and there wasn’t anything to recommend there. But Aldi had two options for sandwich bread – both 12 grain and whole wheat – that didn’t have high fructose corn syrup and were minimally processed. Probably the best buy I found at Aldi was the organic canned tomatoes. 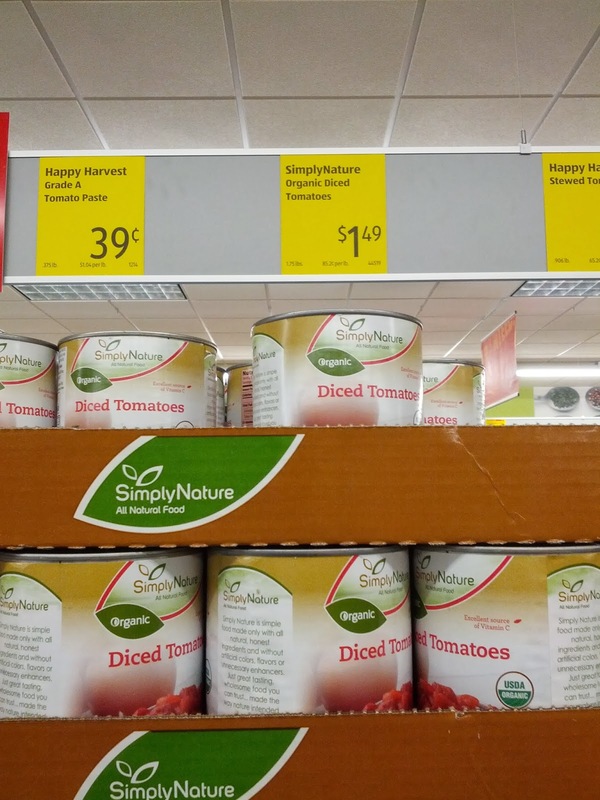 A 28 ounce can of diced tomatoes was only $1.49, which is a terrific price. 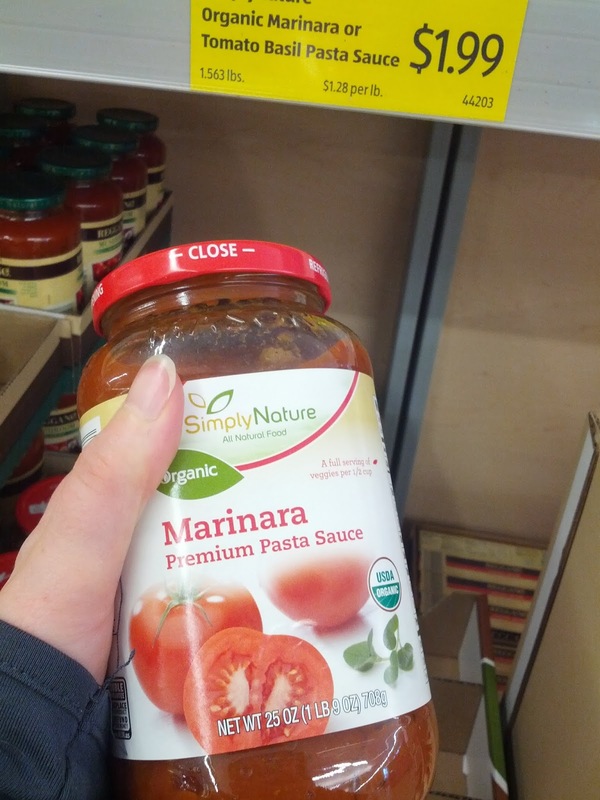 They also had organic marinara sauce for $1.99. I like to make my own sauces from regular tomatoes, but in a pinch, this would be a good, affordable choice. At the end of the store, Aldi also had a good selection of frozen fruit and vegetables at decent prices. It would be worth doing a real cost comparison on the frozen fruits and veggies at different stores to see where the best deals are, since they are essentially the same thing. It’s also worth noting that Aldi starts their workers at well above minimum wage. We saw a sign for $11.75/hour starting out. I like to support stores that don’t hoard profits while condemning their workers to never make ends meet. I’ll definitely be checking out Aldi for particular items on my grocery list. Plus, the more shoppers purchase their organic products, the more likely they are to start to carry more and expand their selection. It’s worth a trip!